Latimer Reef is a dangerous area at the east end of Fisher's Island Sound, four miles southeast of Mystic, Connecticut. _As early as 1800 there was an iron spindle serving as a navigational marker on Latimer Reef. This marker was replaced by a buoy, then finally by the lighthouse in 1884. The Eel Grass Shoal Lightship, about 0.8 miles away, also helped mark the reef for 35 years before the lighthouse was built. Latimer Reef Light is a cast-iron tower on a cylindrical concrete-filled cast-iron foundation. It is a typical example of offshore "sparkplug" lighthouses built in the 1880s and '90s. Three stories inside the tower served as living quarters, while the fourth was a watch deck, topped by the lantern room. The tower was initially painted brown but was later changed to white with a brown band around its middle. _The lighthouse originally had a fifth-order Fresnel lens from Paris exhibiting a white flashing light. Charles E.P. Noyes. Courtesy of Dan Hess. _The lens was replaced by a fourth-order Fresnel lens in 1899. The first keeper, Charles E.P. 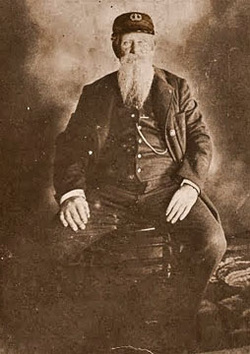 Noyes, a Civil War veteran, was paid a salary of $600 per year. Noyes had previously been the master of the Eel Grass Shoal Lightship. His two assistants received $400 per year. Frank Jo Raymond, a keeper in the 1920s, learned to paint in his spare time and later made his living as an artist. A man of many talents, Raymond rowed ashore on Saturday nights to play saxophone in a jazz band. He also sold some photographs he took during the hurricane of 1938 for use on postcards. 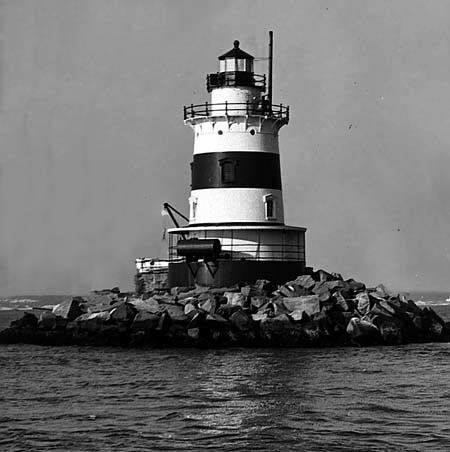 Latimer Reef Light was automated in 1974, and in 1983 its Fresnel lens was removed and replaced by a modern plastic lens. The lighthouse remains an active aid to navigation. It can be seen distantly from the shore and from ferries in the area, but it is best viewed by private boat. Coast Guard lighthouse keeper Neil B. Patton at the lighthouse in the early 1940s. Courtesy of J. Patton. The lighthouse during World War II, courtesy of J. Patton.